My biography is simple, I had the greatest childhood anyone could wish for. My caring and loving parents allowed me to run barefoot through the woods and express my imagination in the Texas sunshine and in her brilliant sparkling waters. If by some miracle of a chance I could go back and live it again I would retrace my steps in the same footprints I left behind. I joined the Marine Corps out of high school in 1979,and I left it in 1991 just short of retirement for reasons I will one day write about. In 1991 I started my first business and found that I learned all the good things I needed to know from my parents. My last duty station was in Havelock North Carolina it was also my first duty station on the East Coast. I love North Carolina so much I would never dream of returning to Texas, even though that is where my heart will always be. I still operate my tree removal business that I started in 1993. Self-employment has given me the greatest freedom of all, the opportunity to go fishing whenever I want. I have fallen in love with the ocean, the streams, the lakes. In the early morning sunrise as it beckons me along to places where scaly monsters await the patient toss of the bait. I have also fallen in love with the pen, it has helped me heal old wounds and offered inspiration. Bo (Beauregard) Kelso is an old man, a wealthy Texas rancher who has outlived his beloved wife, Mary Beth, by three years. Seventy-three years have passed since Bo's intolerant, hateful father Leroy nearly hanged his black ranch hand, Calvin Mercer, for attempting to steal what turned out to have been a bag filled with food for his hungry family. Bo knows that his background of racial intolerance caused by his father has caused terrible problems in his past and he grieves over what he'd done back in 1942. He has given anonymous gifts to local needy causes, but Pastor Clover tells Bo that giving gifts to church doesn't make a person right with God. Bo now rides his beloved horse, "Whisky By The Drink", all over the acres of his ranch, but when he comes upon young teenagers Kevin and his friend Leonard, one white and the other black, fishing on his property, he knows just what to do. And with the help of his ranch manager, Clint, whom Mary Beth rescued years before, Bo succeeds. "Forgiving Waters" is a highly readable and very well-written and edited story of a man's life. Bo Kelso is a wonderful literary character as are Clint, the boys Leonard and Kevin, their parents, Matt with his shortcomings, Elijah Waters, and Bo's loved wife, Mary Beth. Readers will not be able to put this story down until its last page as "Forgiving Waters" is just one of those literary works that will penetrate the reader's heart and mind as its plot runs smoothly to the story's final words. Kenneth Capps has created a monumental story as big as the state of Texas where it is set. Put this book at the top of your reading list, everyone out there! This review couldn't be anymore spot-on than it is. I got goose bumps reading the reviewer's review! I'm pleased that she captured the essence of this tale, for it is a beautiful story of compassion and forgiveness with the proper balance of good-natured wit and humor. Also, there are quite a few awesome one-liners I try to remember for future use too such as the advertised "Barbed wire cuts on both sides of the fence." Sweet stuff! 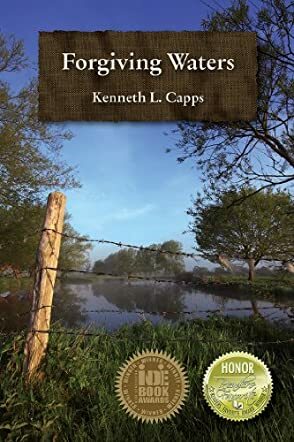 Ken Capps has a natural ability with words and his book comes with more depth than you realize at first glance. The story is well-crafted and the lessons are so appropriate for our society today. This one is a must read.